Countries That Eat Meat | Scott Zies | Toronto, Zies Foods Inc.
For many different countries, meat plays a stronger role in food in some cultures more than others. Religion and even personal preference play a factor to each country’s mass consumption of meat. The industry of meat in a given country can fluctuation throughout the decades due to changes in demands of meat down to even natural causes that influence the market. The average person, per year, around the world, consume an average of 75 pounds of meat. Included meat in the statistic by the Organization for Economic Cooperation and Development is pork, beef, poultry, and sheep. If that statistic was based solely on beef, that is equivalent to about 300 McDonald’s quarter pounders each year for every human on the planet. Yet, some countries do not eat more than a couple dozen of burgers per year while other countries eat way over the global average. Some countries, like India, have a culture rooted in vegetarian-based foods, therefore, India has a much lower meat consumption than other countries. The top meat consumer, Australia consumes more meat per year than any other country in the world. The individual Australian consumes 205 pounds per person every year. Their biggest source of meat comes from Nippon Meat Packers Company, which is one of the top ten companies in the industry. Second in line is the U.S. who consume about 200 pounds annually. To think of consumption in terms of animals, United States citizens consume about 40 chickens per year, with the average chicken weighing about 5 pounds. Smithfield Foods, Cargill, Tyson, and Hormel are the big-names of the U.S. meat industry. Other anomalies occur in countries that influence the meat industry. For example, citizens of Israel consume almost 190 pounds per individual. That high number could be influenced by Israel’s government which pays to advertise and promote their meat industry and to integrate it into their diets. 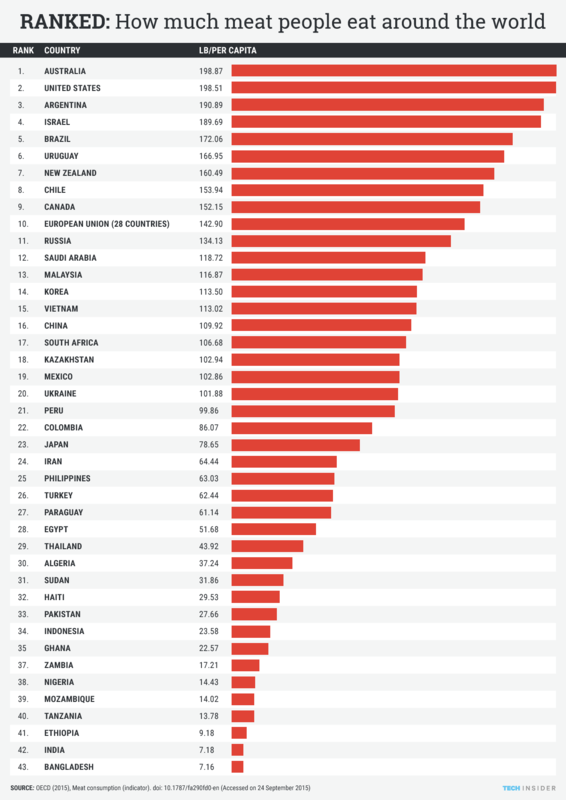 Canada comes in 9th place for top meat consuming countries. The country, itself, has faced price increases and economic recession that directly influence the meat industry. In 2013, Canada hovered around 155 pounds per citizen annually.